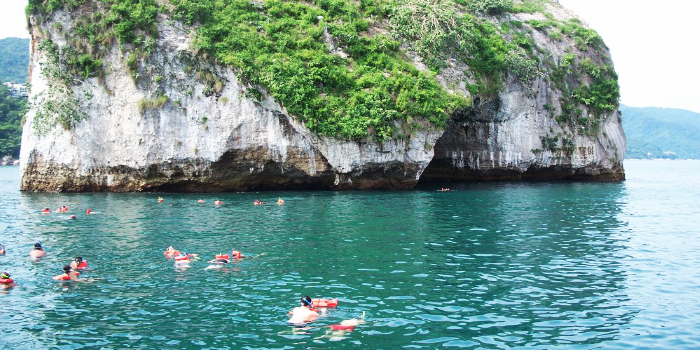 Climb onto our motorized catamaran and Chico's will transport you to one of the finest dive locales in Banderas Bay. Los Arcos is a cluster of craggy islands near the southern coastline of Bahia de Banderas; these picturesque isles are not only a protected sanctuary for aquatic bird species, including the rare blue-footed booby, but sustain a remarkable array of sea life below the water's surface. Once you leave the boat to explore the fantastic underwater habitat around these granite islands, the first thing that will strike you is the incredible clarity of the water; Banderas Bay is a large body of water, but it is protected from the higher winds and rough waters of the Pacific Ocean by its shape. The dramatic granite cliffs that rise above the surface at Los Arcos not only provide a dramatic backdrop to your trip; these rocky walls descend below the surface, providing structure and habitat for an astounding assortment of marine species, including sponges, corals, manta rays, moray eels, brilliantly-hued tropical fish, crustaceans, and mollusks. 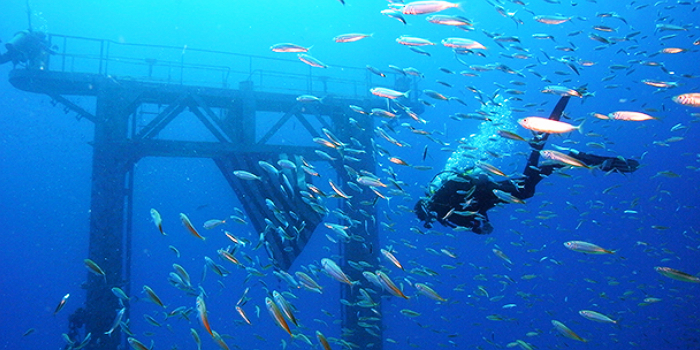 You will be enchanted by this underwater wonderland full of aquatic activity. 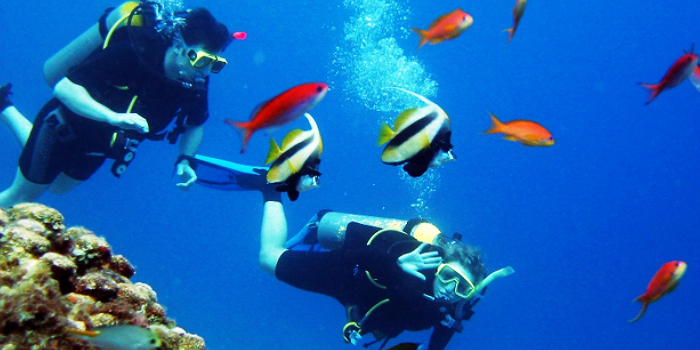 Chico's Dive Operators have set the standard for providing scuba diving and snorkeling expeditions from Puerto Vallarta for more than four decades. We take special pride in providing our clients with the best possible diving experience while vacationing in Vallarta, providing modern, well-maintained gear, a fully customized dive vessel with all the amenities, and fully-qualified dive-masters as guides. Our English-fluent personnel will be with you throughout this trip to ensure that you enjoy a safe and fun scuba adventure. 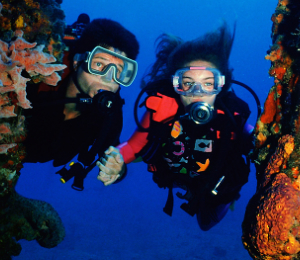 We offer this exciting dive excursion twice every day, so you are sure to fit this tour into the busiest of vacation schedules, even during a short cruise ship stopover. Our forty-foot catamaran has an on-board restroom for your convenience. We provide complimentary snacks, soft drinks, and bottled water on this excursion. In addition to scuba diving, you can choose to paddle around this marine sanctuary in one of our sea kayaks or laze about on a floating mat and sunbathe. 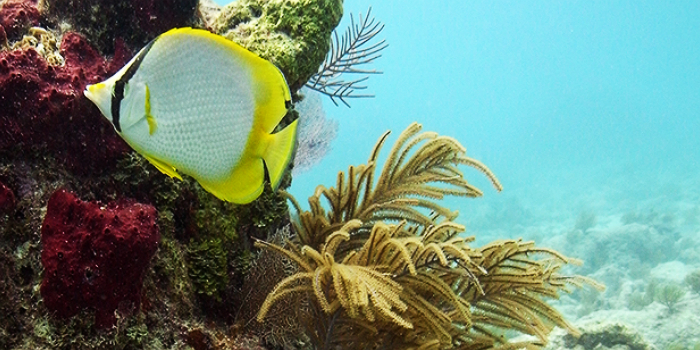 If you have some members of your party who are not certified or do not wish to scuba dive, we also offer snorkeling options on our trips to Los Arcos. 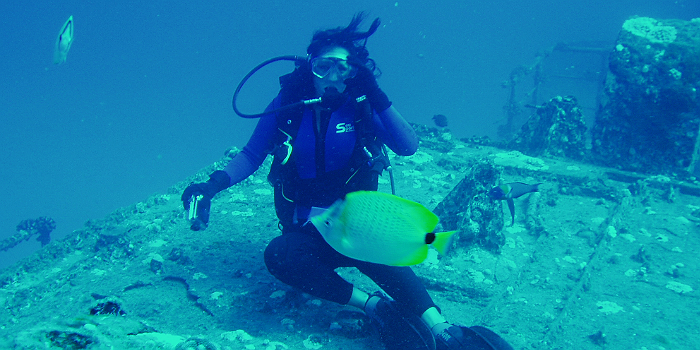 I have been to the Bahamas many times, but Arcos Scuba Expedition is one of my favorite trips! It includes everything that everyone should do here. As a Bahamas veteran, I can say only the best about this experience!